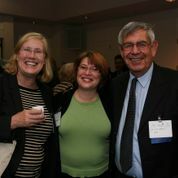 Shown at September 2012 BSF reception in the Israeli Embassy in Washington, D.C. are Dr. Jane Silverthorne, NSF Director of the Integrative Organismal Systems, Dr. Michelle Elekonich, NSF Senior Adviser to the Division Director and head of special NSF-BSF programs and Yair Rotstein, Executive Director of the BSF. An unprecedented partnership has been formed recently between the United States – Israel Binational Science Foundation (BSF), and the National Science Foundation (NSF), the U.S. governmental agency that funds much of the scientific research carried out in the U.S. This extraordinary partnership between the BSF and NSF will support the creation of new dynamic scientific collaborations between the U.S. and Israel, to the benefit of scientists from both countries who seek to collaborate with one another. Israel, through the BSF, will now be one of only a handful of international research partners with NSF, and probably the one with the widest cooperation. The partnership will jointly fund research in four distinct scientific disciplines – Chemistry, Biology (Integrative Organismal Systems), Computational Neuroscience, and Computer Science. Discussions are underway regarding adding new research areas in 2013 including Materials and Ocean Sciences. Two of these programs have already been launched, resulting in some 150 scientific proposals by teams of U.S and Israeli scientists. In recognition of just how beneficial this program will be for Israeli science, the Finance Ministry and Council of Higher Education (VATAT) together have committed $3 million dollars per year for the next three years for the BSF to fund the Israeli portion of the partnership. Science is a key to economic growth in the 21st century and this is particularly true for Israel, the economy of which is based to a great extent on scientific innovation and the resulting high-tech and biotech industries. “Today’s science is becoming more and more complex, and in particular more multidisciplinary, requiring teams of scientists with expertise in various fields. Modern science also requires the latest equipment. Israel, being a small country, needs to have its scientists closely associated with scientists in other developed countries to survive in this competitive world. Its scientists require the cooperation and know- how of others outside the country, as well as access to the latest research devices often financially out of the reach of Israel scientists,” said Dr. Yair Rotstein, BSF Executive Director. This new funding partnership will endorse the best research and further extend scientific knowledge. Through these scientific collaborations working together across borders, vital breakthroughs will positively impact the lives of people worldwide.